There’s a social experiment breeding in the heart of Coachella Valley Arts and Music Festival campground’s. Even for the misanthropes yearning to overlook the festival’s conglomerate of celebrityism and Ista-photo opps, there is a place to step away from your phone and truly become one with your environment. Step into the Coachella Art Studios, a multi use space where art and dreams alike are begotten on the regular. 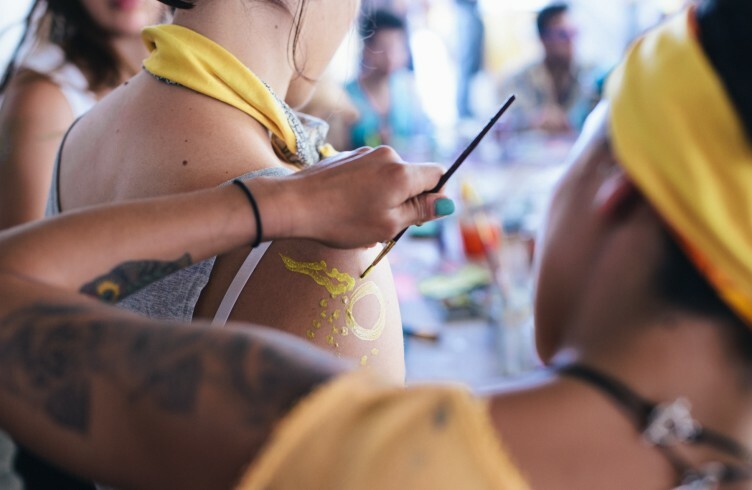 During festival days, CAS supports a DIY arts and crafts gallery and work-space, free for all campers, hosting multiple workshops, inviting creation and friendship. 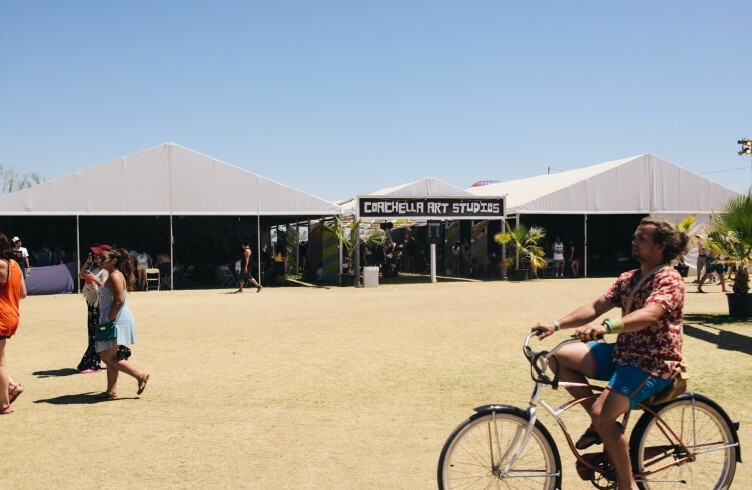 Curated by the non-profit Coachella Valley Art Scene, what began in 2009 as a camp and craft tent, has becomes an creation factory of festival memories and artistic showcase. Founder Sarah Scheideman, has come a long way to cultivate the perfect entourage of local artists and treasurable workshops for the curious and creative camper. This year Sarah invited her MAKE team, including local artists Sofia Enriquez and Joseph Martin of the Westfield Palm Desert art and music lounge. The group designed a functioning gallery of paper mache piñatas paying homage to Coachella Festival field sculptors such as the astronaut and butterfly. ‘Craftifacts’ were also displayed in gallery cases, holding pieces of previous year crafts such as instrument’s of ‘Beat’s Oasis’ and classic sketches of the still in works ‘Stranger Portraits.’ Finally, the hideaway would not be complete without custom designed photobooths, shot by photographers Mathew Houlemard and local visual connoisseur Hoopla EIO. An interactive mural was introduced this year, painted by Sofia Enriquez, over sought by Riverside artist Jon Roach, utilizing neon paint for late night illumination. 2016 crafts included ‘Button Pressing,’ which an abundance of magazines were provided for gem searching and statement punching, ‘Stranger Portraits,’ where Los Angeles artist Mia Amore Rodriguez introduces colors and pads for the ultimate meet and greet drawing sesh, ‘Twist One Up,’ a fashionista’s dream, whom Kristina Stolting herself helps innovators craft headbands and bandanas with an array of striking fabrics, and ‘Afterlife,’ a crafting free for all corner, using recycled materials such as hats, jewelry bits, and leather swatches for all your wallet, phone case, and hand bag needs. 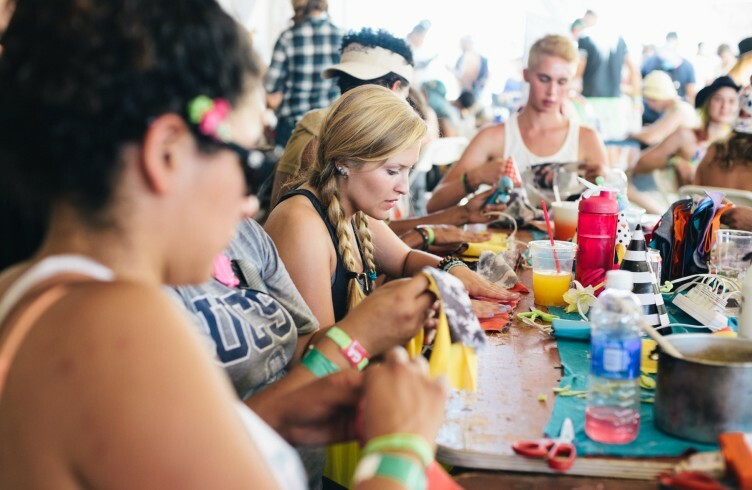 Finally, Riverside artists Nick Bahula, founder of the Free Arts Movement, and Richie Velazquez, aka Deladeso, teamed up to host a wheat paste and wood block workshop, where crafters customize their own small scale Coachella treasure. The studios are solidified with continuous jams by local DJ Alf Alpha, until 2pm. After hours, the Coachella Art Studios becomes the ultimate night scape for dream dwellers and beat heads as ‘The Turn Down Tent.’ A gem in the camp activity night-life, the space is transformed into a relaxation gallery, beginning Thursday night, where dawdlers and loungers become the still-life till 4am. 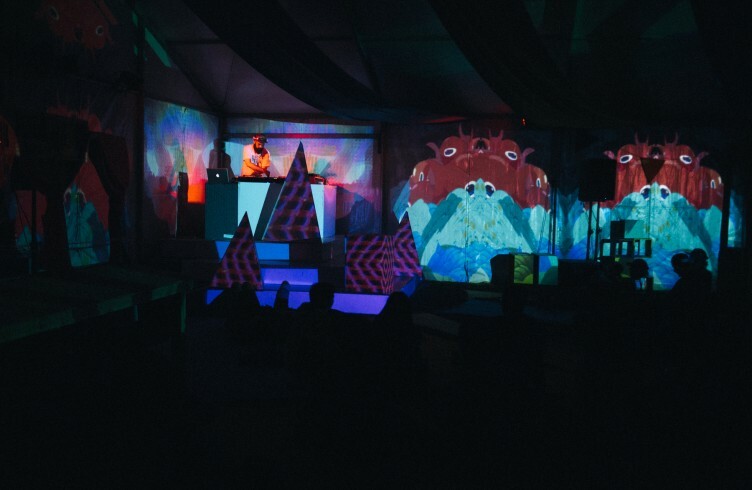 With visuals by Los Angeles based VJ Shawn Curley, aka Majorgape, movement floats seamlessly from surreal nonsensical journeys through cartoons, virtual places, shapes and constellations, to fine art morphs of German Expressionism, Van Gogh and Picasso. Such psychedelia on walls and stage, are set to the most fundamental sound of chill. Hence, Beat Cinema, and additional soundtrack curation booked by Riverside DJ Jeremy ‘Juice’ Campbell, kept euphonious sounds soothing all night, and early morning long. First weekend’s rhythm was hosted and by Michael ‘DMM’ Davis, who DJed alongside palo santo cognoscente AFTA­1, the multi-instrumentalist and grind master Swarvy who sometimes collaborated with poetic rapper Versis, the base hitting Nick Pacoli, beat-steady Ron Sleezy, ratchet bumper Jimbo Jenkins, and world groove guru Free the Robots. 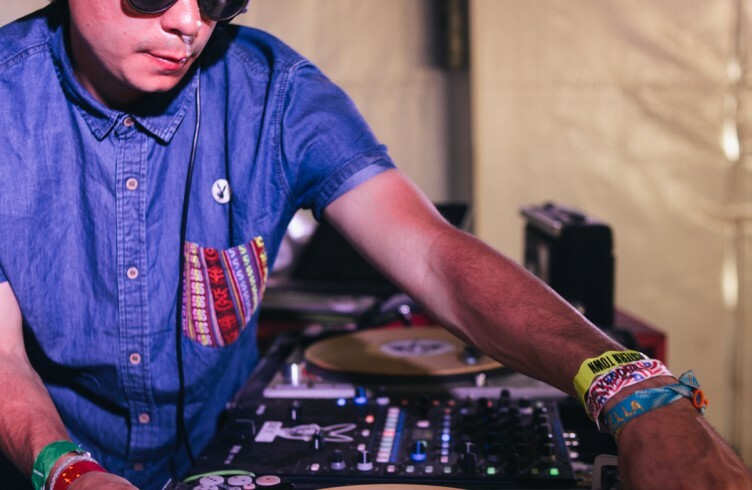 Second weekend, was hosted and DJed by Beat Cinema’s Rick G. adding chill cuts from Just Pudge, mellow mutes by A-Plus, somnolent songs in Erok’s set, laid back tunes with Jerms, transcendental tracks by Softest Hard and a throwback mix to die for by Arti. Coachella Art Studios even gave the den a final touch of ambiance, adding diffusers misting lavender to sleepify the audience, lit palo santo throughout the night, and provided lounge sculptors, malleable for each personal state of physical doldrums. 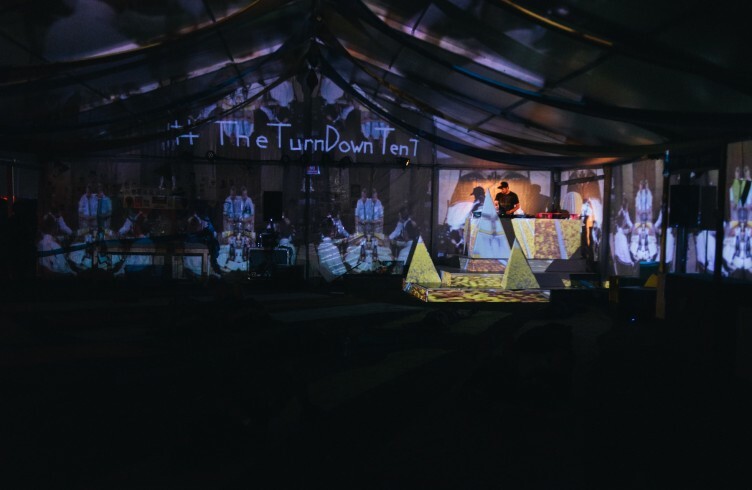 This is the third year The Turn Down Tent has taken place, and curators Scheideman and Campbell, only hope to keep the night and day craft/lounge home growing even deeper into a Coachella camper’s dream experience. Follow the creative journey at www.facebook.com/thecoachellaartstudios and on Instagram @CoachellaArtStudios. Music can be found at www.facebook.com/beatcinema1 and followed @BeatCinema.